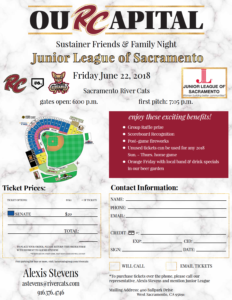 Join your fellow JLS sustainers along with friends and family members for a fantastic evening of baseball on Friday, June 22 at 7 p.m. at Raley Field. Bring your spouse, children, grandchildren and friends! Tickets are $20 each and seats will be in same section. This special night also includes our name on the scoreboard, a band in the beer garden, post-game fireworks and a group raffle for a pair of tickets for an upcoming game.